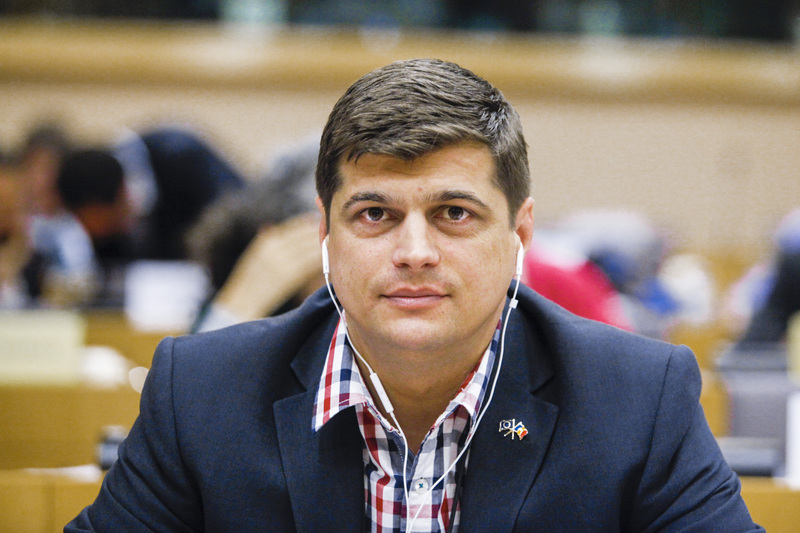 Laurentiu Rebega, a Romanian MEP, crossed the floor of the European Parliament last week to join Marine Le Pen’s Europe of Nations and Freedom group. EURACTIV France reports. The Europe of Nations and Freedom (ENF) group in the European Parliament welcomed its 38th member last week. The defection of the Romanian MEP from the Socialists and Democrats (S&D) has helped establish the extreme right faction by bringing them an eighth nationality, one over the minimum requirement of seven. In joining the ENF group, the MEP said he hoped to promote Romania’s position as a major force in the EU, and ensure that its citizens “benefit from the same treatment as other Europeans, without being systematically stigmatised”. Laurentiu Rebega also left the Romanian Conservative party to join the nationalist PRU party. Since his election last year, the Romanian MEP had shown extraordinary loyalty to his national party, casting 100% of his votes in line with their official position. He also toed the S&D group line in 96% of his votes, according to VoteWatch. “European nationalists must differentiate between the Romanians and the Roma that work in the EU,” the PRU president Bogdan Diaconu told Romanian newspaper Gandul. He added that the Roma were a European, not Romanian problem. The PRU announced that Marine Le Pen would visit Romania in September. Laurentiu Rebega, a friend of Romania’s Agriculture Minister Daniel Constantin, is also under investigation in his home country for corruption in the organisation of an agricultural show. Welcome to Laurentiu Rebega, bringing us our 8th nationality in the ENF group! Long live his patriotic plan for Romania! This amounts to €4,442,759.83 every year, or about €17.5 million over the remaining four years of Parliament's term. Well – we would have less problems if Bulgaria and Laurentiu Rebega, a Romanian MEP is out of the E.U. ! We don’t really need Bulgarian migrants and their faszists MEPS or anything of this sort in the E.U. ! A work for Nigel Farage ! The E.U. has a lot of lifes to save already fleeing from Northafrica ! So Bulgaria and Romania should stay out ! No prob !